Church services: 11:00 - 12:00 - presented by "Churches One"
Fly Fishing & Fly-Tying demonstration 1:30: Gary & Avery Gillett, Renzetti, Inc. 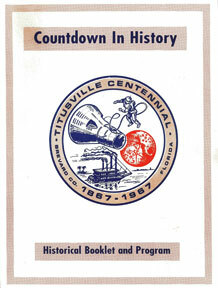 Presentations by Diana Barnhart & Ben Warren assisted by Jolynn Nelson - Presentation of Titusville 150th Anniversary Pins to pioneer families. Collection committee of families (surnames) who settled here 1860-1920 - Chairpersons: Polly Schuster, Ben Warren, Bill Gary, Josephine Wooten, Brenda Gray, Kirk Davis. Plans to refill the Time Capsule in December 2017. Don't forget to give your suggestions and drop off at box located at the North Brevard Historical Museum Downtown. We invite community organizations and businesses to do their own celebrations throughout the year. List your events with GTR and you can use the official anniversary logo and we will help promote your event. Executive Director, Greater Titusville Renaissance, Inc.